I came across this photo on the Los Angeles Library website. 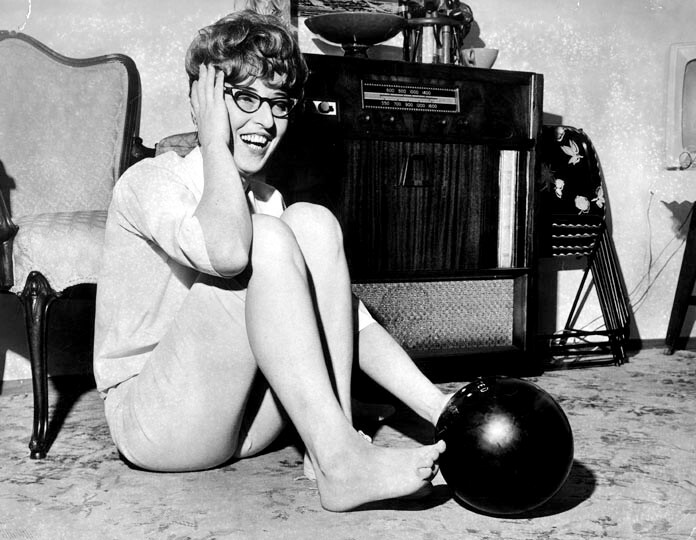 Why in the world would this woman have her toe stuck in a bowling ball? Was she trying to bowl with her feet while walking on her hands? GOOFY! 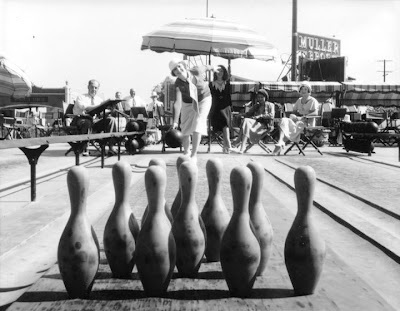 I kept looking for bowling photos, as this is an excellent sport for fall and winter in Los Angeles. I found these vintage shots of outdoor bowling in Hollywood in 1929!! The Muller Family Foundation recently gave a significant contribution toward renovations at Wattles Mansion. This generous donation will make several projects possible this fall and winter. Across Sunset Boulevard on 4 acres, where the Cinerama Dome Theater and a new retail center is under construction, was Muller Brothers Service Station. Opened in 1920 by Jacob’s sons, Walter and Frank, this became the largest service station in the world (including a large automobile supply center), employing 120 people by 1937. Celebrities, from Rudolph Valentino to Clark Gable, came by regularly to get gas or just work on their cars. 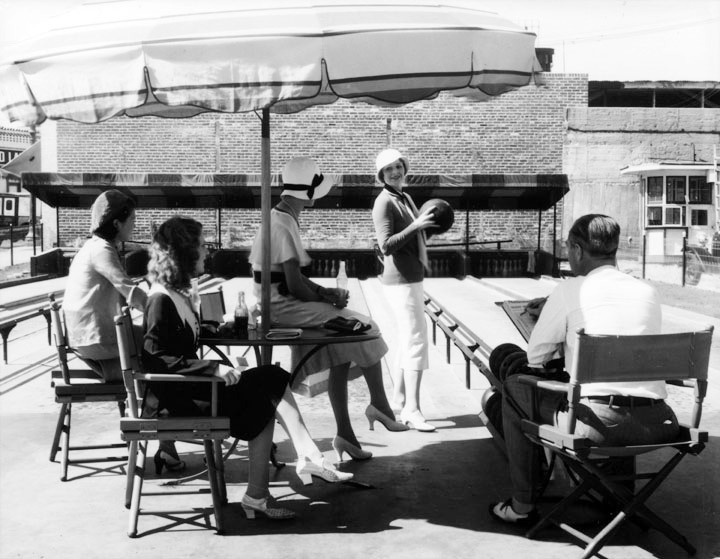 In 1963 the site was sold for the Cinerama Dome Theater, and, at that time, an eventual hotel. In E.O. Palmer’s History of Hollywood, he writes of the Muller Family in 1937; “Both Walter and Frank have been very civic-minded citizens of Hollywood and have always been ready to give of their time and means to every worthy cause for the upbuilding of the community.” It is exciting for Hollywood Heritage to be receiving that same support from their, equally civic-minded descendent, Sheila Muller, 64 years later. Interesting! Soooooo, I'm guessing that this rooftop in Hollywood is somewhere near Hollywood and Vine Street. I just love Los Angeles, Hollywood and it's history! Have a great weekend. Go bowling! I really like your posts about LA history and architecture even though I found your blog via the fiber arts. Always so interesting! I'm a descendant of the Mullers, as Jacob Muller was related to my Grandfather Wendell O. Schell. I appreciate your posting very much, thank you. I have some family history material, but I'm still searching for some facts, as most of our elder relatives have died. Thank you. Heather (Hamilton) Petersen. Thanks for the info, Gary and for the accompanying photos! !